I haven’t had any spare time lately, but I have not forgotten my promise of a new unique dog trick routine video for every 5000 signatures received on the http://www.KeesRescue.com petition to #FreeTheKees. At the time of this writing, we’re at about 17K signatures… please keep sharing and encouraging others to sign. It’s getting cold in New York… let’s save the remaining Keeshonden from Marjorie’s Kennel before we have more cases of frost bite and heat lamp burns. Clancy and I achieved our UKC Rally Obedience 3 title last weekend! With some great scores of 97, 95 and 97, too! Pictured with Judge Robert Wolfe. Clancy and I have been busy doing so many things! Clancy has been bringing smiles to hospitals, nursing homes & more with his therapy dog work… he has completed over 40 therapy dog visits and will soon earn his AKC Therapy Dog title! Now I just need to fulfill the purpose of my Kees Of Dog’s Delight blog and write about it so we may inspire others to go out there and do things with their dog! So please keep checking back in, we have so much to share! For a preview, you can get an idea how busy Clancy has been over the last several weeks in these photos. 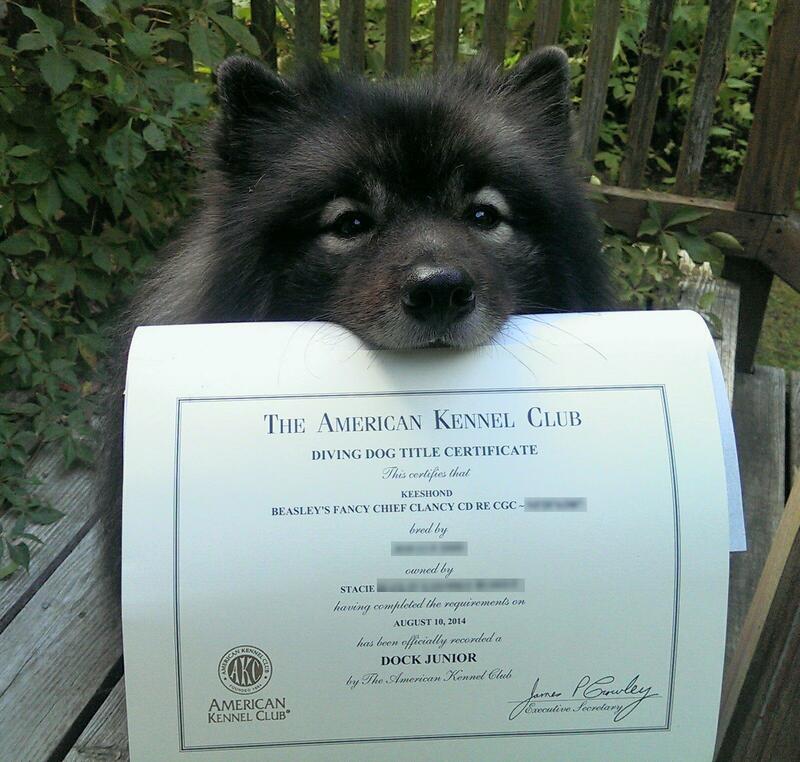 Clancy received his AKC Dock Diving title (1st titled dock diving Keeshond!) Last year Clancy received his UKC Dock Diving title. 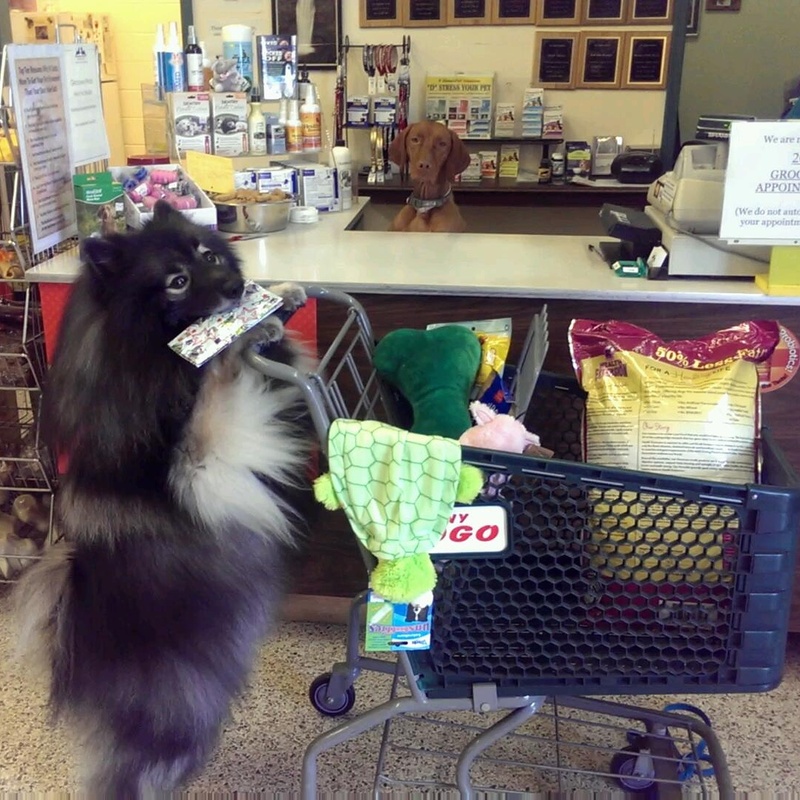 In the meantime, enjoy some teaser pictures of Clancy’s “steal checkbook and go shopping video”. As an extra bonus for everyone’s patience, we are actually adding much more to this fun trick skit! 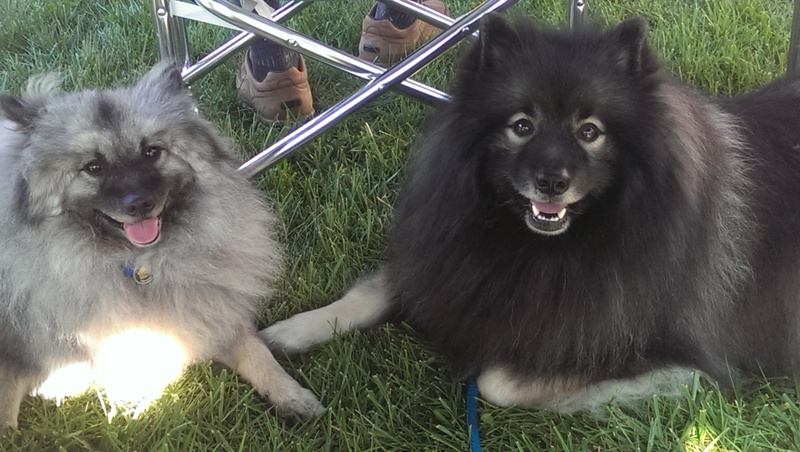 We loved seeing all the Keesies and socializing with folks at the Capital Keeshond Club Speciality on Oct. 11. Puppies make it extra fun! 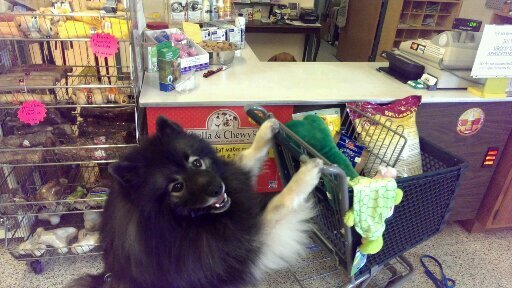 Clancy going shopping — a scene from the trick video we’re working on! Achievements of the last month with a New Blog Post Coming Soon! With all the dog events that Clancy and I have been involved in lately, I have a long list of ideas for future blog posts! 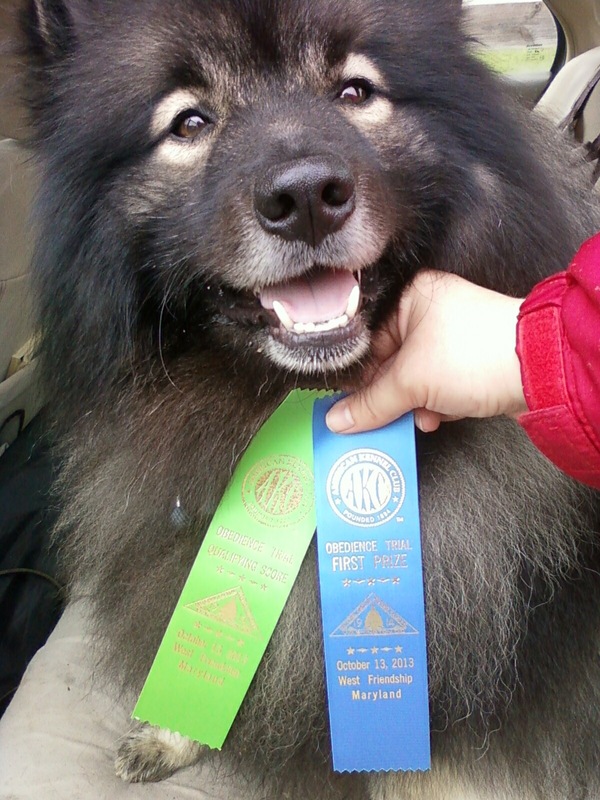 Though Clancy’s keeshond sense of humor did come out during our first Obedience Novice trial, we still got our 1st leg of our CD and 1st place! Over the past month, Clancy also achieved brightening up the day of dozens and dozens of elderly residents in nursing homes through our Pets On Wheels visits. He received rounds of applause from his trick shows he performed for them and lots of love and compliments. 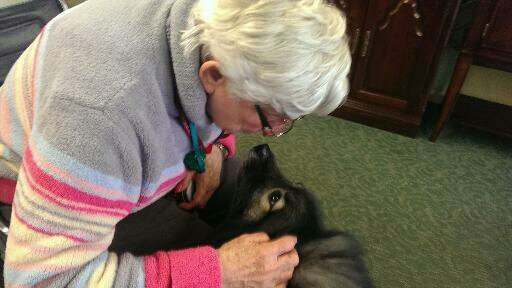 Most importantly, Clancy did get some patients suffering from dementia to break temporarily from their spell to pet Clancy. This weekend Clancy and I are entered in another UKC Altered Conformation show and we are entered in three Rally Obedience level 2 trials. I’m hoping to accomplish his UKC R02 title all in one weekend. Graduating to all off-leash with the off-set figure 8 challenge (where we have to do a figure 8 circling bowls of treats and/or toys) is going to be a huge challenge for Clancy! Next week things finally slow down, so I hope to write a detailed blog post on how fun and challenging Rally Obedience is! Til then, please share what you’ve been up with your furry best friend!? Clancy and I enjoyed so many activities together throughout the month of August and we hope to encourage you to go try something new with your dog! “Part 2” of Dock Diving with the Flying Fluff-ball blog post is still in progress pending more information that I’m gathering from various resources. So in the meantime … enjoy! Since Clancy brings smiles to so many people’s face when we’re out and about, I wanted to share him with those that could really use a smile by becoming a Pets On Wheels volunteer. We had our first visit with a senior assisted living facility in early August and just had another visit recently with another facility targeting the dementia guests. Clancy was such a champ as he happily greeted dozens and dozens of elders. He even performed some tricks that earned him rounds of applause. Clancy was tuckered out after his hour and a half visit (pictured above) and we look forward to returning there in a couple of weeks. *More on Therapy Dog work in a future blog post! Despite being late to compete in an AKC Rally Obedience trial due to an absurd amount of traffic which caused us to literally run straight from the car to walking into the Rally course blind, Clancy and I earned our 2nd leg towards his AKC Rally Novice title. I was concentrating so much on making sure Clancy was only paying attention to me and not to all of the new distractions we just walked into that I didn’t perform the first station, a figure 8, correctly. I crossed the center point 4 times instead of 3 resulting in a 10 point deduction, but at least it was our only deduction. We still managed placing 2nd with 90 points and hope to finish up his RN title within a few weeks. *More on Rally Obedience in a future blog post! Clancy, with my dad, at the State Fair while I was checking out the bee exhibit. Clancy seemed to be one of the most popular “walking exhibits” throughout the day. Last weekend was “Volunteer Appreciation Day” at the Maryland State Fair. Normally dogs are not permitted at the State Fair, but Clancy was welcomed because he is a volunteer as a therapy dog with Pets On Wheels. Fortunately, the weather was just tolerable for him to join me with a high of 80 degrees F. We actually didn’t make it to all the things we were hoping to see, but it was still a lot of fun. Imagine you were walking at a highly attended public event with a celebrity, or in this case, with a beautiful creature that no one has seen before… that’s what it was like for us while we were there. Pets On Wheels volunteer, Clancy, admiring an agricultural exhibit at the State Fair on Volunteer Appreciation Day. We never made it more than 20 or so feet without being stopped by what would start out as a couple of people, but then quickly multiplied into a dozen amazed and curious people. 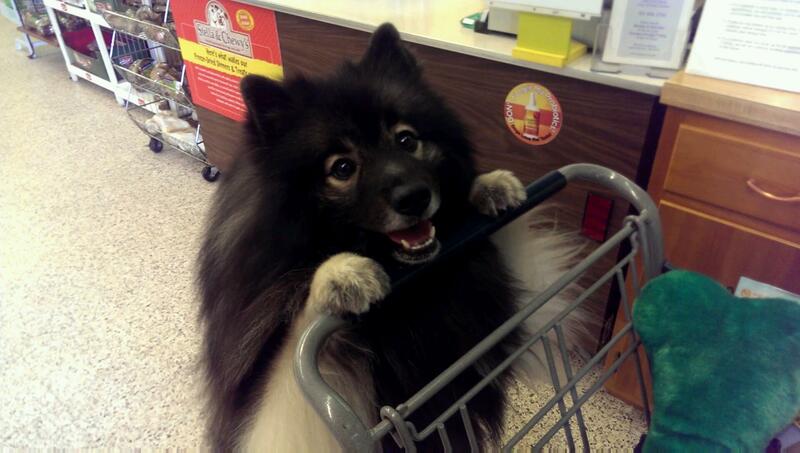 Now only if the Keeshond Club of America paid me a dime for every time I answered “What kind of dog IS THAT?” I would have been able to take off work this week! I do love it when people know what kind of dog Clancy is, even if they pronounce it wrong (see my “What is a Keeshond” page). 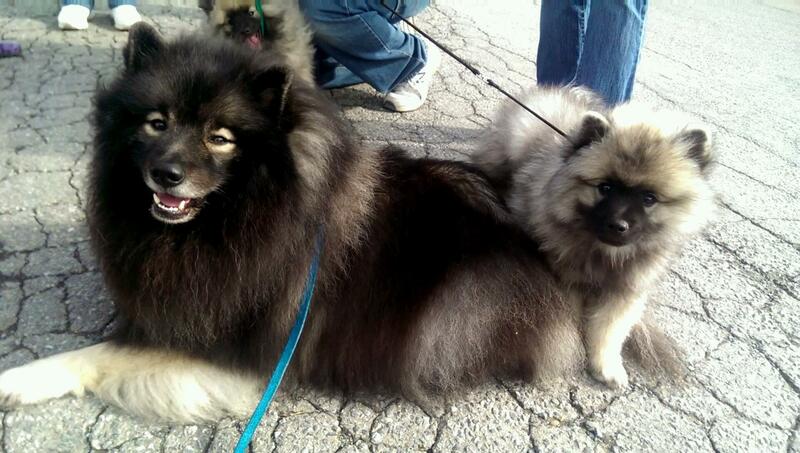 Several families tracked us down (they said they saw us through the crowd and just had to catch up to us) that used to have a Keeshond in their lives. It was heartwarming to hear their stories. 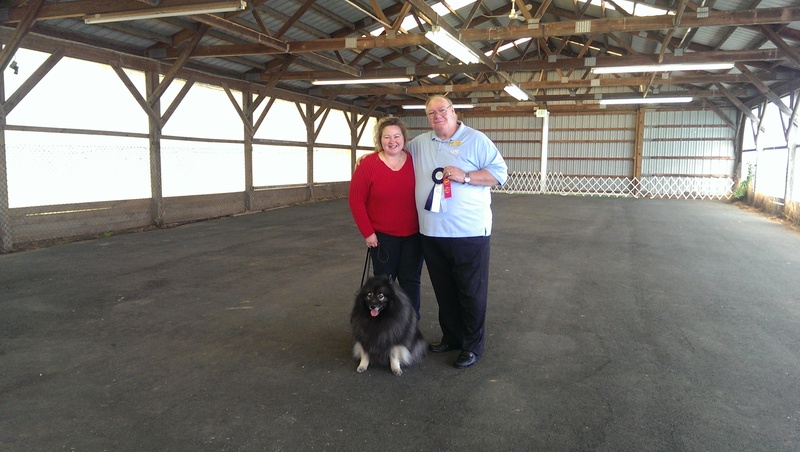 Clancy and I with the honorable UKC Judge Rolando Mata whom awarded Clancy Best in Show Altered in Show 2 on September 1, 2013. 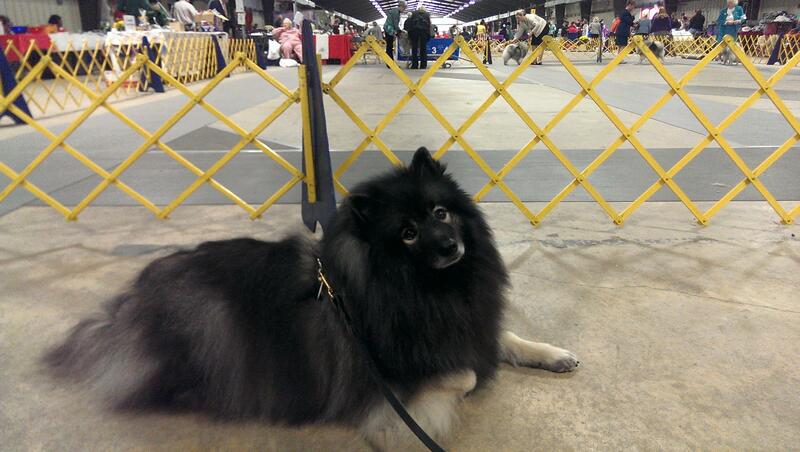 Clancy won 2 BIS and 1 RBIS out of the 4 altered shows this weekend! * More on how to exhibit your altered dog here: Do You Have a Neutered or Spayed Pure-Bred Dog? You Can Still Show Them! With Clancy and I accomplishing all this in one month (plus our weekly dog training club activities), we hope to inspire you to go out and do an activity with your dog! Don’t have one yet? Perhaps my first physical print article (another August milestone for me that will be showing up in a local publication next week) can help you with that! It is titled “Where to Find Your New Best Friend” (the picture above was taken of Clancy at 6 weeks old when it was decided that we were going to be best friends!) I fine-tuned it below by generalizing some things to make it more useful for the general public. Please keep in mind that I was limited on how many words I could have in my article… if I had more space, I would have liked to have been more detailed! “Where to Find Your New Best Friend” by Stacie B. Did you know that the secret to living a longer and healthier life may be who you choose to be your best friend? Where can you find a best friend that lowers your blood pressure just by being close to you, who will love you no matter what and never argue with you? The answer may be right in your own town. Your county shelter has a wide variety of furry, scaly or feathery friends to choose from! Take a peek right now online at www.petharbor.com to see the large variety of animals near you that need homes right now. There are so many kittens, cats, puppies and dogs (mixed and pure-breeds!) hoping for the opportunity to be your companion. You could even find “Other” animal types such as gerbils, rabbits, birds, reptiles or even farm animals there too! So, you have your heart set on a certain dog breed? Have the animal shelter contact you if your ideal pet comes in! To make sure you and your breed of choice will be happy together, visit www.akc.org/breeds to do your research ahead of time. Too many dogs are given up because their owner wasn’t prepared for their breed specific traits! If you are interested in a mixed-breed, be sure to research all the breeds that are part of that mix. You will also find the contact information in that link for the “AKC parent club” of each breed to help you find your breed’s rescue or to help you find a responsible and legitimate breeder (see “Breeder Referral” in the above link). Please be sure to do your research on the breeder, ask them lots of questions and talk to their references. Be prepared to walk away if something doesn’t seem right. Where do you NOT want to buy a puppy? 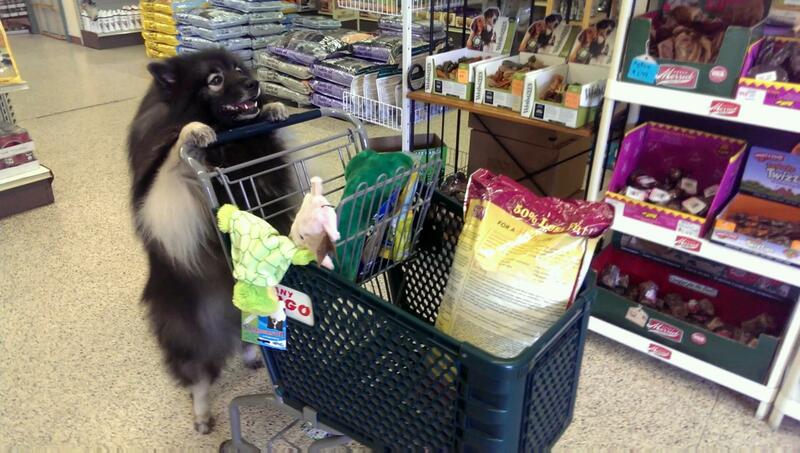 At a pet store or through the Internet without visiting the source! You would likely be supporting the inhumane puppy mill industry and odds are you’ll end up being heartbroken with a pup that has health, socialization and/or behavior problems. An Internet search for “puppy mills” will yield much information on this inhumane trade. So what are you waiting for? Your Best Friend is out there waiting for you!